Collect 6 mL (5 mL min) of whole blood drawn into an ARUP provided single lithium-heparin tube (ARUP supply # 54015). See Collection tab for more information. Collect 4 mLs of whole blood – 1 mL in each of the four QFT-Plus blood collection tubes (ARUP Standard supply # 54012 or High Altitude supply #54010). See Collection tab for more information. Client supplies are currently available; lithium-heparin tubes or 4-tube collection pack on eSupply or call ARUP Client Services at (800) 522-2787. The single lithium-heparin collection tube option (3000400) offers the most convenience to clients. A single lithium-heparin specimen is collected, incubated at room temperature for a minimum of 15 minutes and then shipped refrigerated to ARUP Laboratories, where all further pre-analytic specimen processing is conducted. The single lithium-heparin specimen should be sent to ARUP the same day it is collected in order to avoid exceeding the 48 hour stability. We encourage clients to order QuantiFERON-TB Gold Plus electronically through their LIS or ARUPConnect. View the interface map here. If the client cannot send specimens the same day they are collected, then ARUP recommends the QuantiFERON-TB Gold Plus, 4-Tube assay (3000399). The 4-tube assays requires the same pre-analytical processing steps as the current 3-tube QuantiFERON-TB Gold assay. 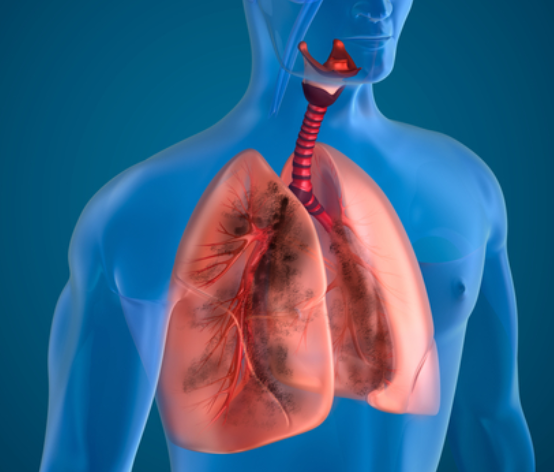 The new QuantiFERON-TB Gold Plus assays use the same principles, test procedures as the current assay, but is optimized with tuberculosis-specific antigens that elicit both CD8+ and CD4+ T cell responses –enabling a more comprehensive assessment of cell-mediated immune response to TB infection. For more questions, contact ARUP Client Services at (800) 522-2787, keyword: quantiferon. 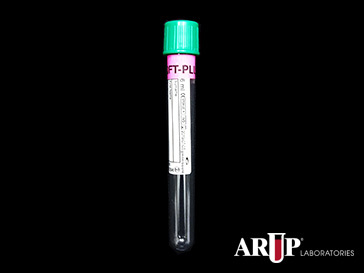 Collect 6 mL (5 mL min) whole blood directly into the QuantiFERON-TB LiHep Collection Tube (ARUP supply #54015) available online through eSupply using ARUP Connect™ or contact ARUP Client Services at (800) 522-2787. Note: The specimen must be submitted in the ARUP-provided collection tube due to the requirements of the laboratory automation. No other lithium heparin tubes are acceptable. Please note that tubes with less than 5 mL of blood will not be accepted. After collection, the specimen needs to remain at room temperature for a minimum of 15 minutes. After 15 minutes at room temperature, refrigerate the specimen within 3 hours of collection and transport to ARUP. Send the specimen to ARUP the same day it is collected. 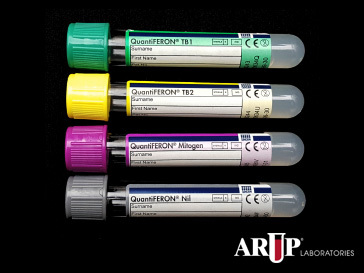 Collect 1 mL (Min: 0.8 mL, Max 1.2 mL) of whole blood directly into each of the four tubes in the QuantiFERON-TB (Standard) 4 In-Tube Collection Kit (ARUP supply #54012) available online through eSupply using ARUP Connect™ or contact ARUP Client Services at (800) 522-2787. Note: Tubes should be between 17°C and 25°C (63°F to 77°F) at the time of blood collection. Immediately after filling the tubes, shake them ten (10) times just firmly enough to ensure the entire inner surface of the tube is coated with blood, to solubilize antigens on the tube walls. Note: Over-energetic shaking may cause gel disruption and could lead to aberrant results. After mixing, and within 16 hours of collection, incubate upright at 37°C for 16 – 24 hours. After incubation, centrifuge for 15 minutes at 2000 – 3000 RCF (g). After centrifugation, transport entire contents in each of the 4 original collection tubes. When collecting at elevations between 2,650 and 3,350 feet, it is recommended that blood be collected using a syringe. Collect 4 mL of blood into the syringe then immediately transfer 1 mL into each of the four tubes in the QuantiFERON-TB (Standard) 4 In-Tube Collection Kit (ARUP supply #54012) available online through eSupply using ARUP Connect™ or contact ARUP Client Services at (800) 522-2787. Collect 1 mL (Min: 0.8 mL, Max 1.2 mL) of whole blood directly into each of the four tubes in the QuantiFERON-TB (High Altitude) 4 In-Tube Collection Kit (ARUP supply #54010) available online through eSupply using ARUP Connect™ or contact ARUP Client Services at (800) 522-2787. When collecting at elevations above 6,150 feet, it is recommended that blood be collected using a syringe. 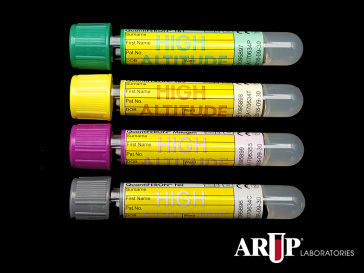 Collect 4 mL of blood into the syringe then immediately transfer 1 mL into each of the four tubes in the QuantiFERON-TB (High Altitude) 4 In-Tube Collection Kit (ARUP supply #54010) available online through eSupply using ARUP Connect™ or contact ARUP Client Services at (800) 522-2787. If help is needed determining whether specimens can be transported to ARUP within 48 hours, please contact the ARUP Transporation Department at TransportationPRS@aruplab.com. WHO released Guidelines on the management of latent tuberculosis infection (http://www.who.int/tb/publications/latent-tuberculosis-infection/en/. How do clients obtain the single lithium-heparin tube? QuantiFERON-TB LiHep Collection Tube (ARUP supply #54015) available online through eSupply using ARUP Connect™ or contact ARUP Client Services at (800) 522-2787. Can clients use their own lithium-heparin tube? No. The lithium-heparin tube supplied by ARUP was validated for our high-volume automation system. Yes, the older QuantiFERON-TB Gold will be inactivated on August 20, 2018 or until the supply of collection tubes is exhausted at ARUP.